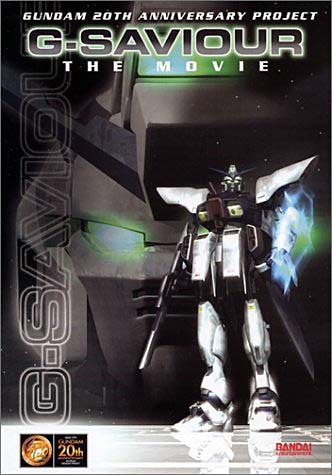 G-Saviour is a live-action Made-for-TV Movie made as part of the Big Bang Project, celebrating Gundam's 20th anniversary, along with ∀ Gundam and a couple of video games such as Side Story 0079: Rise from the Ashes. A novelization, a PlayStation 2 game (which acts as a sequel), and an audio drama were released to tie-in with the movie's release in Japan. In Universal Century 223, the Earth Federation collapsed, leaving behind a vacuum of power in its demise. The Sides that were previously under Federation control became independent, calling themselves "Settlements". Two sides emerge for control over them: the Congress of Settlement Nations (CONSENT) which controls Sides 2, 3, 5, 6, and 7 and The Illuminati which controls Sides 1 and 4. The movie is centered on Mark Curran (Brennan Elliott), a former CONSENT Mobile Suit pilot who finds himself fighting for the Illuminati when he was framed for the murder of a prison guard by his rival and former supreme commander, Jack Halle (John Lovgren) during a food crisis which has struck most of humanity. In addition, he must protect the only key to ending the crisis; a bioluminescent energy formula powerful enough to sustain plant life and create an agricultural breakthrough. Aside from the Universal Century setting, the movie has almost nothing to do with Gundam overall. This, combined with the poor production qualities, has resulted in fans and Sunrise alike trying to pretend it never happened, but not officially barring it from canon. The novelization and the PS2 game, on the other hand, were praised for being much more faithful to the franchise. The titular mobile suit, and pretty much anything related to the movie did't appear, or was mentioned, in any other Gundam media until 2013. And in case you're wondering, this movie was made in Canada, not in the US. Animesque: The Japanese version is an enforced example. As if the changes in the intro, dialogues, and scenes weren't obvious enough, it even has an Anime Theme Song (played in the ending credits), "Orb". Applied Phlebotinum: The bioluminescence formula. Artistic License  Physics: The formula is pretty much used as a means to create an artificial sun. Any physics expert can tell you that bioluminescence just doesn't work that way. Black Dude Dies First: Very narrowly averted with the mobile suit pilot who Mark rescued in the intro. Played straight for the prison guard, who was killed by Jack to frame Mark. Big Bad: Garneaux. The man is pretty much a power-hungry General Ripper; his motives can be seen below. In the game, we have Colonel Bais, Garneaux's confidant. Canon Discontinuity: Downplayed. Sunrise has said "we don't like to talk about G-Saviour" in the past, and they haven't mentioned it since. However, Gundam doesn't have a strict wall between "canon" and "non-canon," and it hasn't been explicitly contradicted by anything made since, either. The Cavalry: The Illuminati's mobile suits arrive to aid Gaia's defenders just in time after Jack has been defeated. Char Clone: Jack, sort of. He serves as Mark's rival and former superior officer. Sans a mask or a red mobile suit. Also Rysis from the game, Reed Fox's rival and the pilot of Project Raven. The Chick: Dr. Cynthia Graves, the formula's inventor. Colonel Badass: Jack is a Lieutenant Colonel and an ace Mobile Suit pilot, as one might expect from a Char Clone. Conspicuous CG: All of the mobile suits, spaceships, and space colonies are rendered using ( laughably bad) CGI. Curb-Stomp Battle: The Gaian Freedoms (not that one) are helpless against the CONSENT Bugus during the Final Battle, only winning the battle through Mark's and the Illuminati's help. Justified; it's mentioned in bonus materials for the movie that the Freedom was completely outdated by the time of the movie (though it still doesn't explain why the other suits are as well). The real justification is that the Gaian Freedoms are piloted by civilians with no piloting skills or experience, and their CONSENT enemies are well-trained professional mobile suit pilots. Dull Surprise: The movie's acting sometimes crosses this territory. The Dragon: Jack serves as Garneaux's adjutant/right-hand man throughout the movie. The Empire: CONSENT. Think about an Earth Federation of Zeon. Expy: CONSENT is pretty much a Titans stand-in (combined with the Principality of Zeon), while the Illuminati is AEUG. On a related note, the Bugus are pretty much Zakus while the Freedoms are GMs (they are part of the RGM-series). The Bugu is actually a GINN. Evil Laugh: Jack has his moments, such as when he was defeated by Mark. As if he wasn't evil enough. Face Death with Dignity: Mimi when the ship she and Garneaux boarded gets shot down by CONSENT Rais. False Flag Operation: Mimi pulls this off by hacking Gaia's defense systems and firing them on a CONSENT ship. Final Battle: On Side 8 . And it's pretty much the only real Mobile Suit battle in the movie! Frameup: Jack kills the prison guard, framing Mark for the murder. General Ripper: Garneaux, who wants to destroy the bioluminescence formula to maintain control over the Sides. HeelFace Turn: Mimi after learning of Garneaux's real motives above. Idiot Ball: Whoever designed CONSENT's capitol clearly doesn't know that it's a really bad idea to build a research room next to a friggin' prison cell. The Illuminati: In nothing but their name. Here, they're the La Résistance opposing CONSENT. Imperial Stormtrooper Marksmanship Academy: None of the CONSENT guards can hit either Mark or Cynthia when they're escaping from the lab. They managed to duck from the line of fire, but it's not like they can't aim below them. This results with Cynthia using one of the formula vials to blind Jack and the guards, allowing them to escape via the morgue. Jump Cut: The Japanese version's editing is guilty of this . Meaningful Name: Side 8, also known as Gaia. The bioluminescence formula, created by Gaian scientists (namely Cynthia and Rigo) that can be used to sustain plant life and thus, solve the food crisis. As if the naming wasn't obvious enough, the colony even has its own greenhouse. The Mole: Mimi is working for Garneaux; she'll do whatever it takes to steal the formula and hand it over to Garneaux, including dragging Gaia into war against CONSENT. The Mistress: Garneaux has one who appears to come out of a nazisploitation movie. Non-Action Big Bad: Garneaux doesn't fight any of the protagonists and relied on both Jack and his troops, being a general. And not a frontline one. The same goes to Colonel Bais. No OSHA Compliance: The Sturges Air Base's runway is even more unsafe than the Congonhas Airport . Not-So-Well-Intentioned Extremist: General Garneaux tried to forcibly procure the serum, supposedly to help with a food crisis. But in reality, he wanted to destroy it in order to implement a policy of selective starvation all in the name of power. Pragmatic Adaptation: The novelization feels more like a conventional Gundam series than the movie. Put on a Bus: Mark and Cynthia in the PS2 game, having left Gaia for Earth. They are replaced by Fox and Asaka, respectively. Putting on the Reich: CONSENT officers, including Jack and Garneaux, wear Nazi-esque, East German, Federation, and Zeon-ish uniforms throughout the movie. Some of their medals resemble French 11th Parachute Brigade badges, too. Reality Ensues: Using mobile suits that are piloted by civilians with no military experience to fight against well trained professional mobile suit pilots would have ended in disaster if not for intervention of the Illuminati. Reasonable Authority Figure: Gaia's Chief Counsellor, who is Cynthia's father. Garneaux also appears to be this the first time we see him, having a friendly chat with Mark. But the more we see of him, not so much. In the PS2 game, we have the Illuminati's commander, Ben. Round Table Shot: Used when Mark and Jack has a heated argument during the party. Schizo Tech: Sort of; despite taking place 70 years after Victory Gundam, the mobile suits in this movie are technologically disadvantaged when compared to those from Victory Gundam. One IMDB review pointed out that they're outdated than even those from the One Year War. Space Station: The Sides, natch. Stock Footage: Used during the intro as the film cuts and zooms to Earth. Its placement is quiet random, to say the least. Too Dumb to Live: Garneaux sealed his fate when he decided to steal a Gaian spacecraft to escape and doesn't notify the nearby CONSENT forces about it..
Reed: Bug...? Raven, is a Mobile Weapon!? What Happened to the Mouse? : After being defeated by Mark (he only managed to disable Jack's Rai), Jack wasn't seen again after the Illuminati reinforcements arrive. Zeerust: Not unusual for Gundam. Notably, Garneaux's TV is laughably outdated by today's standards. On the plus side it can be activated just by snapping your finger.